I didn’t think I’d ever find myself in the midst of a hackathon but here I am, one day after Halloween, playing around with data, surrounded by 40-something other hackers. 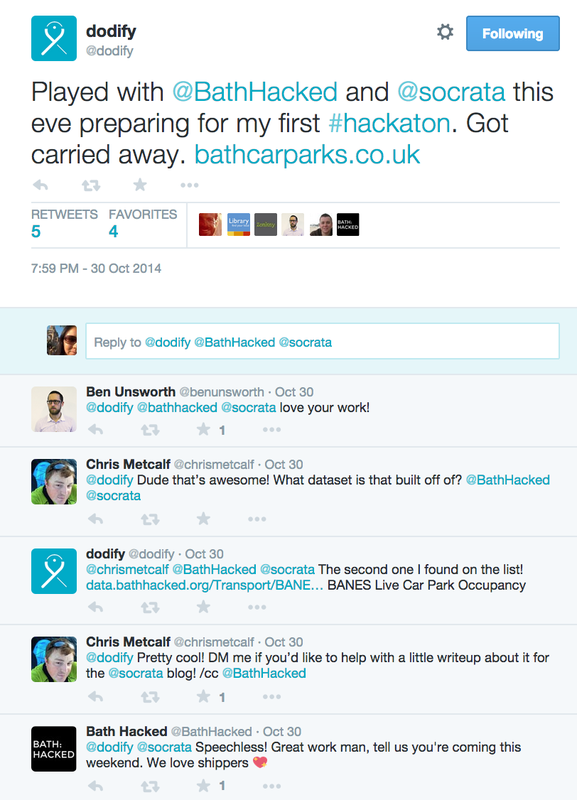 I was approached by the founder of Bath: Hacked, a not-for-profit initiative that makes open data available for people to make useful things (usually apps) that will benefit the city of Bath. Unsurprisingly, the organization consisted mostly of males and the founder feared it would end up turning into a ‘boys’ club’. He contacted me via She Codes: Bath to see if I’d be interested in getting involved. Before I knew it I found myself on the steering committee to help organize this weekend’s 36 hour hackathon. The committee consists of a lot of dedicated team members and it’s amazing to be involved in something that a) people are so passionate about b) does something for the greater good. I love the concept of living in a ‘smarter city’ that encourages its citizens to come together to build things that will help make Bath a more accessible city. M signed up for the hackathon and decided to study up on the available data. 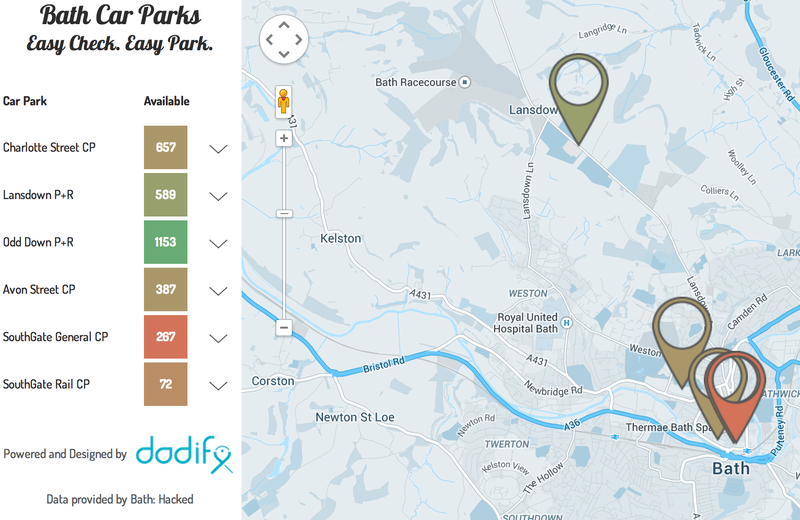 One dataset interested him in particular – the BANES Live Car Park Occupancy dataset that informs how many parking spaces are available in most of Bath’s major car parks (that’s parking lots for the non-Brits). Before he knew it he started creating a nifty little app that people could go on to check car park info rather than driving around in frustrating trying to find a car park with available spots. Six hours later Bath Car Parks was ready to be launched. One tweet later and half of Bath is now applauding M for his creation. All this just from using data that’s freely available for anyone to use – I love it! Anyhow, I’ve digressed. Back to the hackathon. Generally (and by generally, I mean in my own opinion, which I’m going to assume is the opinion of the majority…) non-developers are daunted by the idea of participating in hackathons. We wanted to be as inclusive as possible and while we obviously wanted developers to participate, we also encouraged anyone who had an interest but didn’t have much experience in the computer programming world to attend. Building a great app requires a diverse set of skills and many don’t realize that they may possess skills that could contribute to an amazing app: ideas people, analysts, designers – these are all people that a hackathon could benefit from. Yours truly received a tutorial on how to manipulate data and create interesting visualizations of the content. Seeing as my life is all about food I decided to play around with the BANES Food Hygiene Ratings dataset and I managed to whip up this little bad boy! I wanted to locate all the restaurants in Bath’s city centre (BA1 and BA2 post codes) with a food hygiene rating of 1*. This is what I came up with. The cool thing: this all comes from live information which means that the plots will change as other restaurants are added/food hygiene ratings change. The not-so-cool thing: the platform I’m using doesn’t make it possible to view the restaurant’s name on the plotted map and you have to click on ‘view details for this row’ in order to get more information. Not very convenient for the user. Later skaters, it’s hack time!